Modify a webcam to "see" infrared by removing the small IR filter usually located behind the lens. 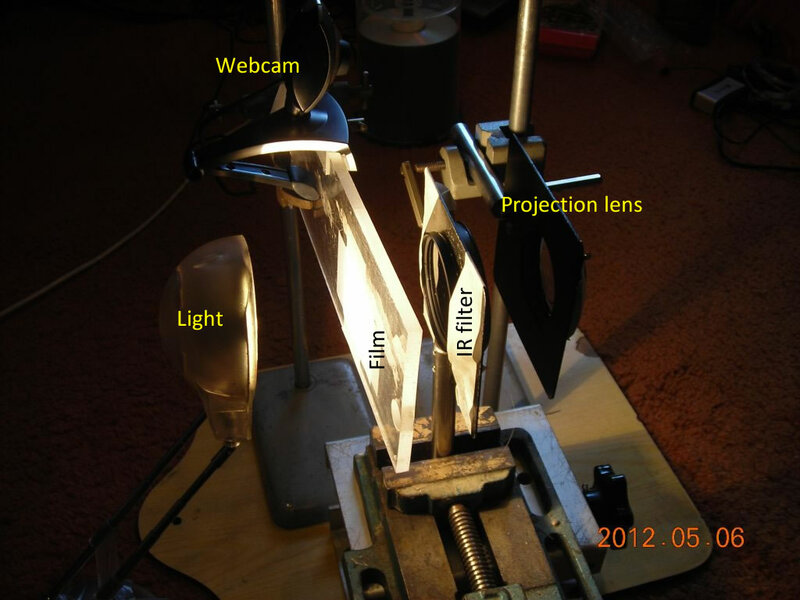 Then, arrange the projection setup shown below. The "film" in this case is a piece of printed tracing paper and is taped to a bit of clear plastic as a support. The IR filter (cutoff wavelength 760nm) is meant for cameras and is easily available from EBay (search for "IR filter"). Fiddle around with a projection lens (something like 10cm focal length) to get a suitable image on a screen. With a bit of luck, the projected image will be clearly visible on the webcam, but totally invisible to the naked eye. The second photo below is from the webcam, after a bit of enhancement.